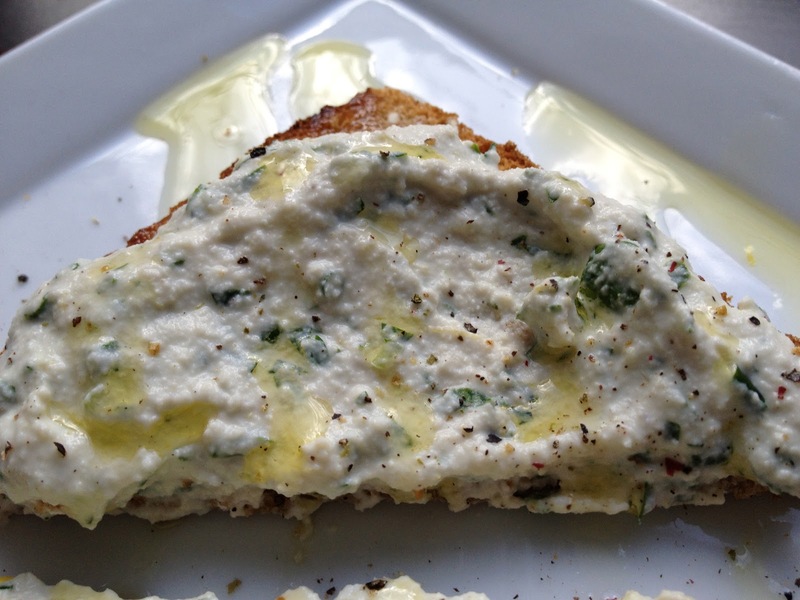 I love my homemade cashew ricotta cheese. I make it plain (cashews + water) and then jazz it up depending on the meal (e.g., adding lemon juice, sautéed onions, nooch, garlic, salt, pepper, etc.) For lunch today, it was fresh lemon zest & herbs. This, like many things with strong flavors, gets better with a little time to rest since the lemon has time to infuse the ricotta and the herbs. This is one of my favorite things I make. Soak the cashews overnight. Place them into the blender with 1/4 to 1/2 cup water. Blend and then strain in a small mesh strainer until excess water has run through (unless you do this in a Vitamix, there will probably be no need to drain.) Save the cashew milk for tomorrow’s shake-y shake! Zest the lemon and chop the parsley and chives. Mix with the ricotta along with salt and pepper. Taste and adjust. Toast the bread. 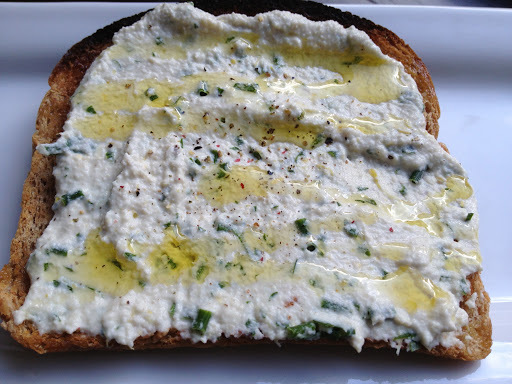 Spread with ricotta. Drizzle with olive oil and a sprinkle of mixed color pepper. Enjoy!